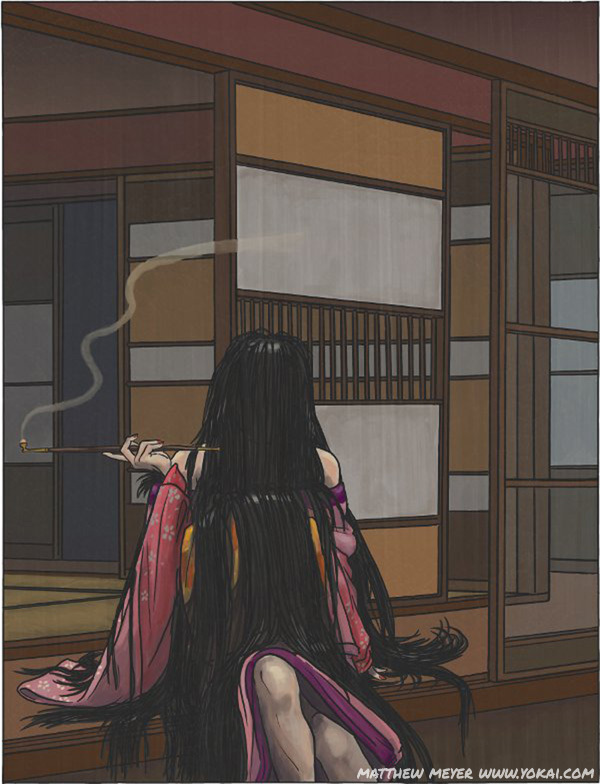 APPEARANCE: Kejōrō is a prostitute whose face and body are hidden behind a curtain of long, matted black hair. She appears in red-light districts and brothels. In most stories, it is only the hair on her head that is disturbingly thick and long, but in some stories, her whole body is covered in thick hair, like some kind of beast. INTERACTIONS: A kejōrō’s victims are the young men who frequent brothels and red light districts. Thinking he sees a girl that he recognizes from behind, a man runs up to the kejōrō to speak with her. When she turns around, her face and body are covered by a thick mat of hair, hiding all of her features. Her victim is shocked by the horrible, hairy monster in front of him, giving her time to attack her victim, tangling him up in her hair and using it to slice him up. Despite this, reports of kejōrō-related fatalities are very rare. 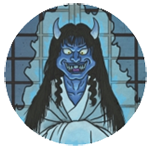 Despite her horrible appearance to humans, the kejōrō is said to be quite popular with yokai. So popular, in fact, that male yokai frequently fight each other over her, competing for her affection. Kejōrō seem to return this devotion as well; in some stories, a kejōrō will cut off her hair and send it to her lover (human or yokai), or tattoo his name into her skin to prove her undying devotion to him. 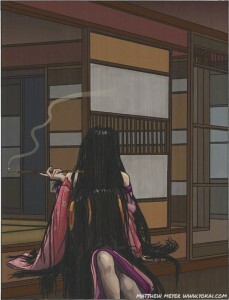 ORIGIN: The earliest records of kejōrō go back to Toriyama Sekien’s “One Hundred Demons of the Past and Present.” There is some debate over his original description as to whether the kejōrō has a normal face under the matte of hair, or whether she is a faceless monster, related to the nopperabō or the ohaguro-bettari, with various yokai researches weighing in on either side of the question.